This article I found discusses the down falls to caffeine and why it is not always effective. Many people drink coffee in the morning to stay awake, intaking a dose of caffeine to combat the feeling of tiredness in the morning. Although, drinking coffee in the morning will help wake a person up, drinking coffee routinely in the mornings will only add to the problem for people who feel tired. When people drink caffeine, it becomes harder for them to fall asleep at night. As a result, they will miss out on a good night sleep causing them to feel more tired in the morning. 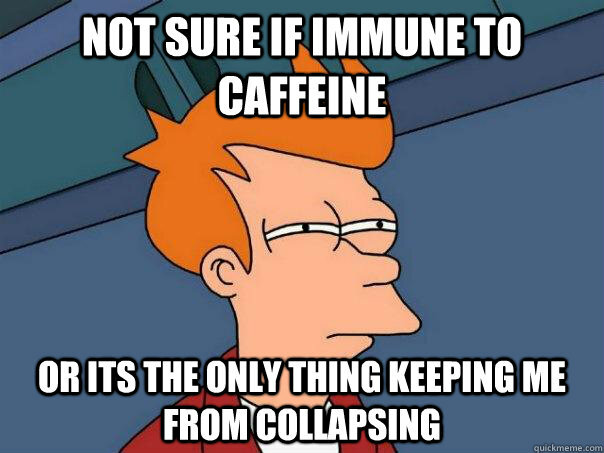 This very easily becomes problematic as many people fall into the cycle of needing caffeine to stay awake because they cannot sleep as well at night due to the caffeine they are already imbibing. For some students and many professors, starting the morning with a cup of coffee feels like second nature at this point, and something I am sure many people would find challenging to cut out. Luckily, the article also mentions many tips and forms of advice to break this habit and help keep it at a level where a person’s sleep will not be affected. Some tips the study suggests include not drinking coffee in the late afternoon after the caffeine from the morning has worn off. Also, aside from what is commonly assumed, it is actually more effective to have coffee in the morning 1-2 hours after waking up and not right away. Doing this, a person will experience the best effects of caffeine. When we first wake up, our body is still in a natural awakening stage that should not be disrupted. Powering through the first hour or so of the morning before drinking coffee will allow a person to experience caffeine working with its best results and will also lower their chances of their body’s sleeping habits taking a sacrifice. This entry was posted in Uncategorized on September 16, 2016 by Ariana Caruso. I too covered one of my blogs on coffee but from a different angle. i discussed the physical damaging affects coffee has on an individuals teeth. Here’s an article that can explain to you why your teeth turn yellow from coffee and how to prevent it, if you haven’t already read my blog. I found what you said to be so interesting. It makes sense not to drink coffee when our body is still in the “awakening stage”, but why? What affect does the coffee have on you during this stage? Does it possibly speed up the process and not allow the body to naturally become aware? Being someone who absolutely hates coffee, I actually found this post interesting to read about; mainly due to the amount of coffee I know my mom drinks. My mom insist that she cannot get her day started without having a cup of coffee with extra creamer, and of course sugar. For someone who is so into being fit, it’s pretty ironic that she consumes this much caffeine every morning and again during lunch. Although I couldn’t relate this topic to myself personally, I think it was cool that I read about something that applies to my mom. Below is a link to a blog that talks about the effects of too much caffeine. Caffeine is not to be taken lightly, I know all to well what to much coffee can do when you need a good nights sleep, it turns into a cycle of needing more the next day and so on and so forth. I will take the point about waiting to drink your morning cup for a couple hours into consideration because that makes a lot of sense. This post was very beneficial to me because I was actually thinking about becoming a coffee person. I am definitely reconsidering that at the moment. Is there a recommended amount of coffee to drink to get that boost but not too much. Have to agree that coffee is great, in small amounts. Last night after pulling a all-nighter that I should only drink approximately 4.2 8 oz cups of coffee. Sadly I doubled that, immediately regretted it in the morning. I found it really interesting reading your blogs because the problem you talked in this blog also applied to me when I was still in high school! Under the stress of all AP courses and ACT and SAT, coffee became my number one must have. 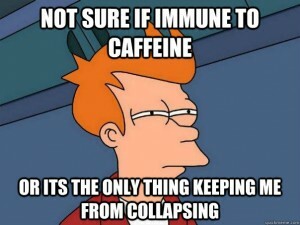 I drink coffee in the morning, in the afternoon, even at night if I need to stay up when I am preparing for a test. And by drinking this much coffee had really damaged my body inside and out. I felt horrible, and my skin looked terrible. So this is a really bad experience for me. And here is a link to a blog that also talks about coffee, and I hope you enjoy reading it!